Video shows execution of American journalist, Steven Sotloff. The Islamic State has executed another hostage, this time beheading American journalist Steven Sotloff. A video has been released of the incident, but due to alleged self-censorship across the web, the footage has been suppressed. American Journalist, Steven Sotloff, has been executed by the Islamic State. LOS ANGELES, CA (Catholic Online) - Catholic Online has found a source with the video and we will work to provide you with either a link to the footage or to host the video for as long as we are able. It is our belief that our readers deserve the truth about Islam and the threats we face in the world, and you should have the option to view, or to refrain from viewing, disturbing, but true content. Please use the link below with discretion. 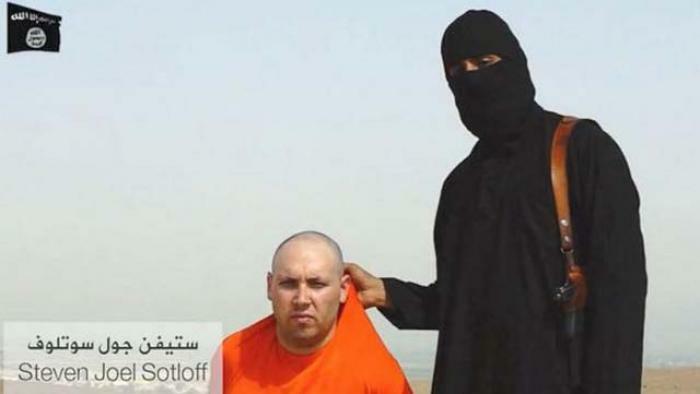 Click here to view the Steven Sotloff beheading video. (WARNING GRAPHIC CONTENT, REDIRECTS) Note: Page is in German, translate and adjust webpage settings to permit viewing. The Islamic State has executed American journalist Steven Sotloff, who they have held hostage for 13 months. Two weeks ago in an execution video that showed the murder of journalist James Foley, Steven Sotloff was threatened and the U.S. government was warned to stop its strikes against the Islamic State. Those attacks did not stop. Instead they appeared to intensify and American officials have openly discussed an expansion of the campaign, and the possibility of attacking targets within Syria. Sotloff has now been killed in an act of retaliation. The executioner in both videos appears to be a man dubbed "Jihadi John" and he speaks with an apparent British accent. Authorities believe they can identify him and he is now wanted by international officials. In the video, Sotloff appeared steeled and prepared for his final moments. He displayed virtually no emotion as he conveyed a statement that was likely prepared for him. After speaking, his executioner explained that the execution was happening because the United States had refused to end its attacks. In the next scene, the black-clad killer is seen literally sawing into Sotloff's neck, and Sotloff appeared to instinctively react by planting one foot forward on the ground as if to resist. The video faded in that instant and cut to an image of his severed head on his body. In a final scene, Jihadi John is seen holding David Haines, a British citizen, who they threaten to kill should the allies of the United States continue to aid in the fight against the Islamic State. His executioner appears to be a man dubbed 'Jihadi John' by authorities. This is the same man who killed James Foley two weeks prior. The final words of Steven Sotloff are transcribed below as well as the brief speech from Jihadi John. "Obama, your foreign policy of intervention in Iraq was supposed to be the preservation of American lives and interests, so why is that I am paying the price of your interference with my life? Am I not an American citizen? We've spent billions of U.S. taxpayer dollars and we've lost thousands of our troops in our previous fighting against the Islamic State, so what are the people's interests in reigniting war? "From what little I know about foreign policy, I remember a time when you could not win an election without promising to bring our troops back from Iraq and Afghanistan and to close down Guantanamo. "Here you are now, Obama, nearing the end of your term, and having achieved none of the above and deceivingly marching us the American people in the blazing fire." "I'm back Obama, and I'm back because of your arrogant foreign policy towards the Islamic state, because of your insistence on continuing your bombings and . on Mosul Dam, despite our serious warnings. You Obama, have but to gain from your actions but another American citizen. So just as your missiles continue to strike our people, our knife will continue to strike the necks of your people. Help save Christians from genocide! This is a fate no innocent person deserves. ACT NOW!